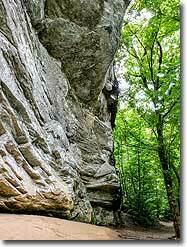 Raven Rock is the namesake landmark of Raven Rock State Park in the Piedmont region of North Carolina. 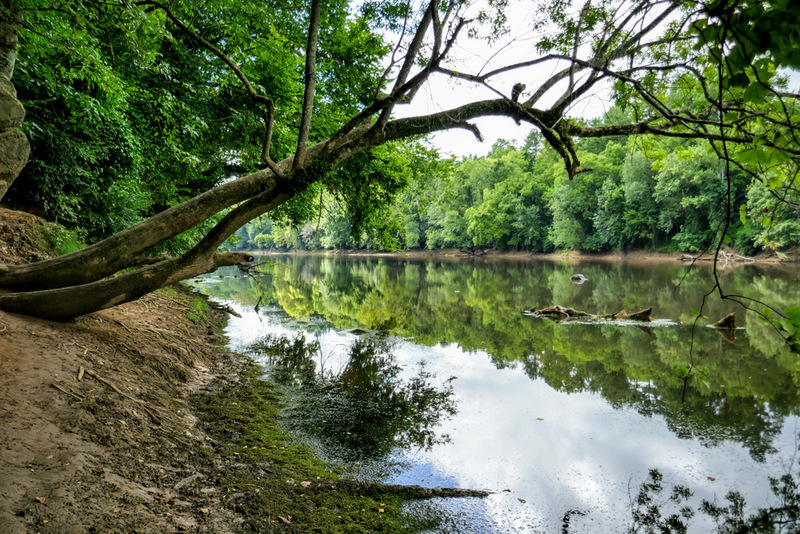 The park sits along the fall zone between the Piedmont and the Coastal Plain, less than an hour south of the Triangle. 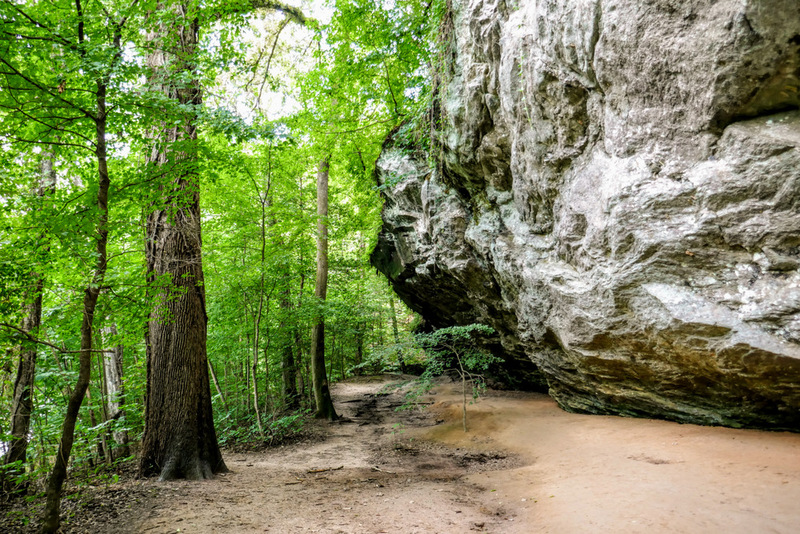 This fall zone gives rise to geological oddities highlighted by Raven Rock and Cliffs of the Neuse State Parks. 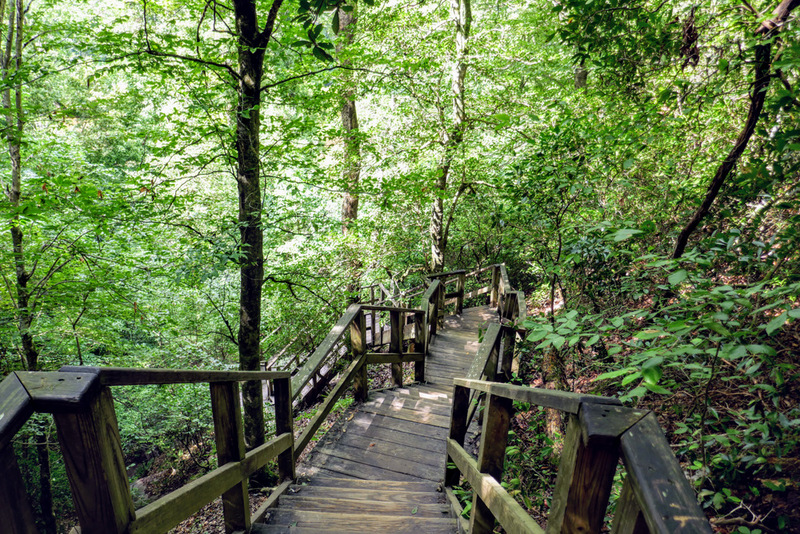 The most popular trail in the park and one of the most popular hikes near the Triangle leads to the cliff base of Raven Rock and an overlook 150 feet above the Cape Fear River. 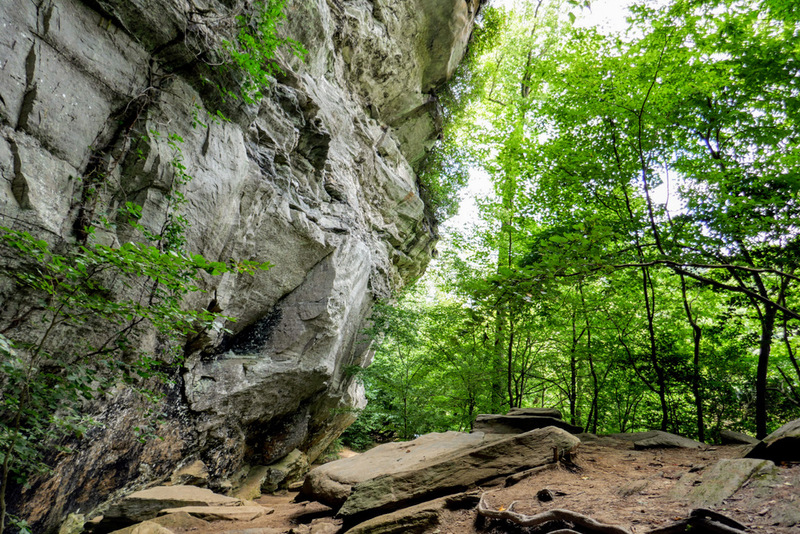 These chalky white cliffs at times rise 100 feet, an awe-inspiring scene this far east of the Blue Ridge Mountains. 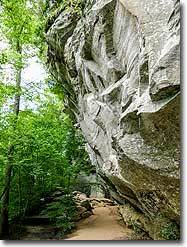 You won’t find cliffs like this until you reach the Kings Mountain range near Charlotte or the Sauratown Mountains near Winston-Salem. 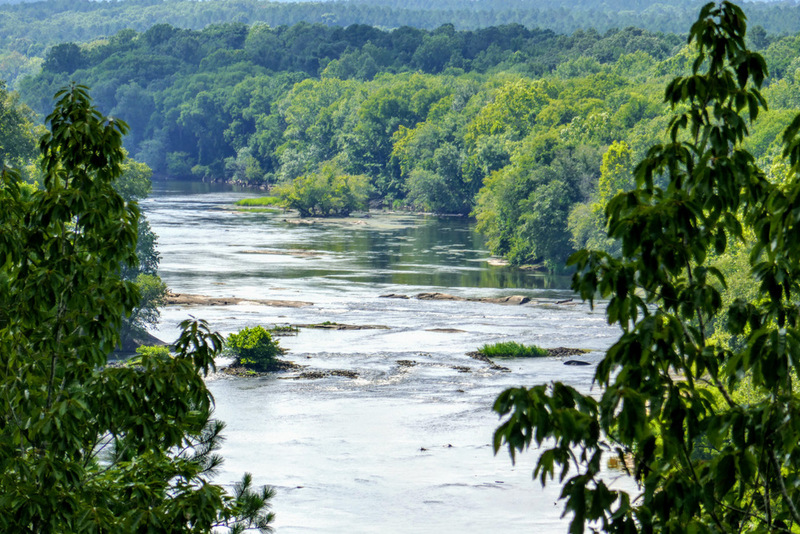 In addition to exploring the cliff base, the overlook has nice views upriver of the Fish Traps rapids and Northington Ferry. 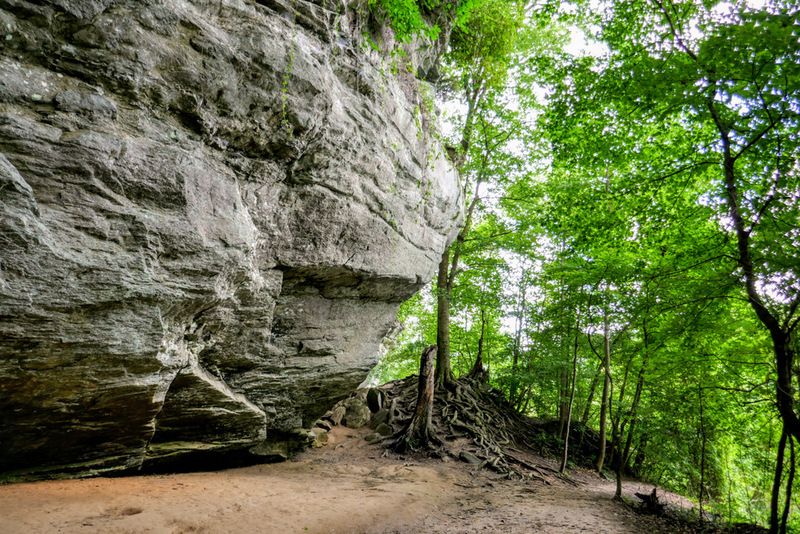 At 2.7 miles, this is a relatively short hike that can be completed in under 90 minutes. 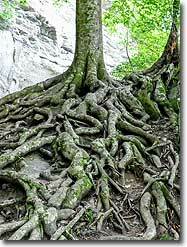 If you would like to hike more, consider the Campbell Creek Loop Trail on the west side of the park. 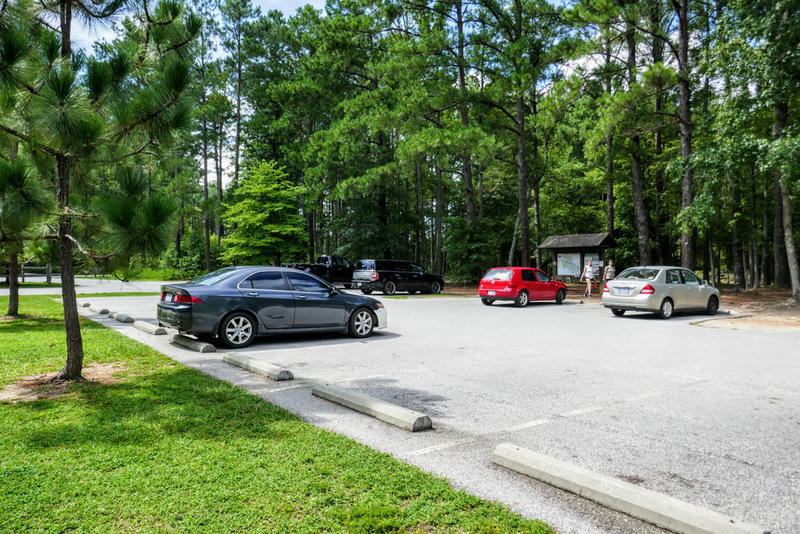 Mile 0.0 – The Raven Rock Loop Trail begins on either side of the parking lot. 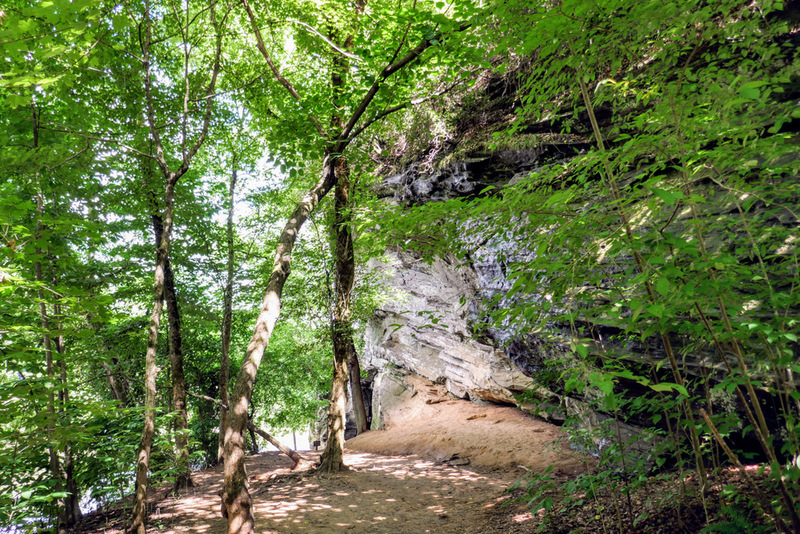 Follow the Raven Rock Loop Trail (orange circle blaze) east past the wooden fence and immediately pass a T-junction with the American Beech Trail (white circle blaze). 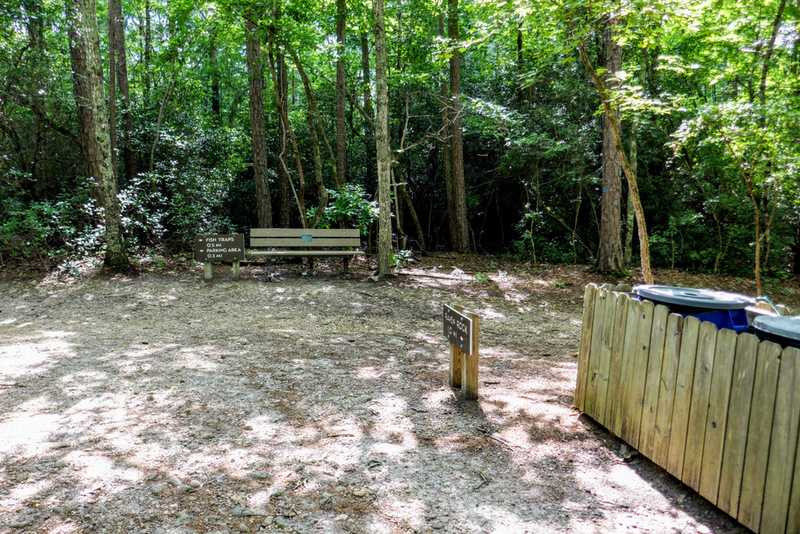 Mile 0.15 – Restroom and picnic facilities are located off to the left of the trail. 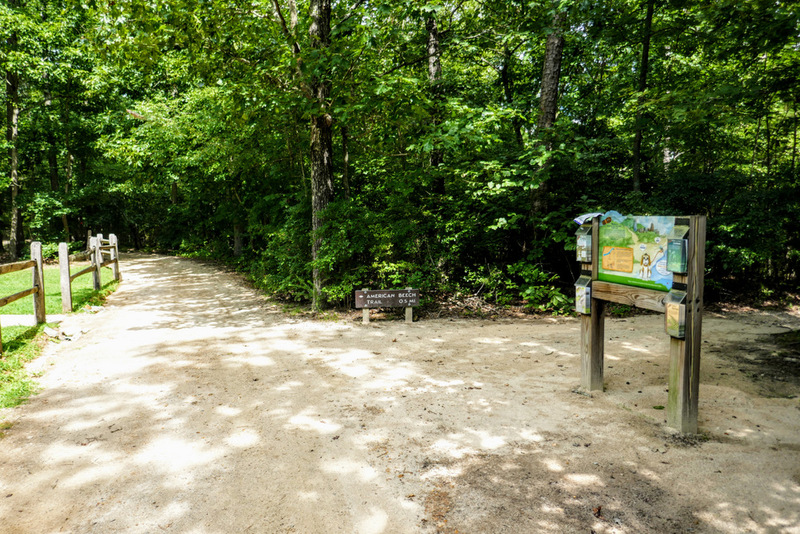 Mile 0.2 – T-junction with the American Beech Trail on the right. Mile 0.25 – Y-junction with a gated forest road on the left. 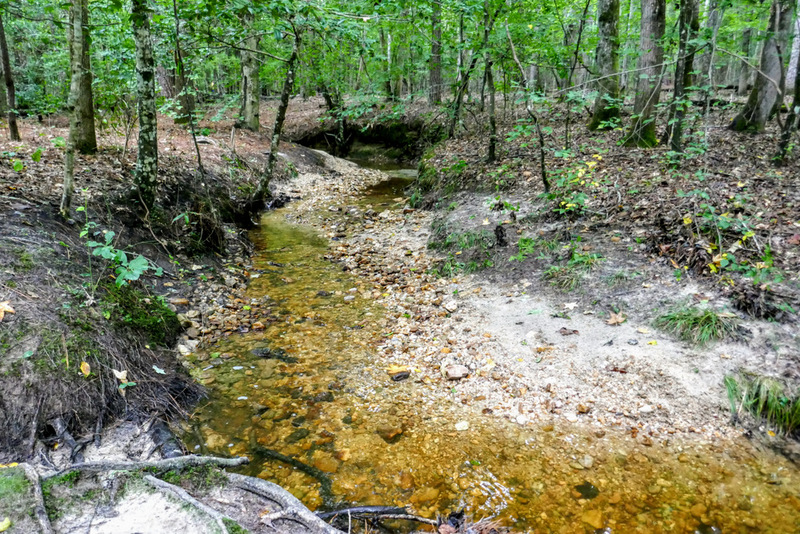 You’ll pass through thicker pine and hickory/oak forests as you enter the Little Creek watershed. 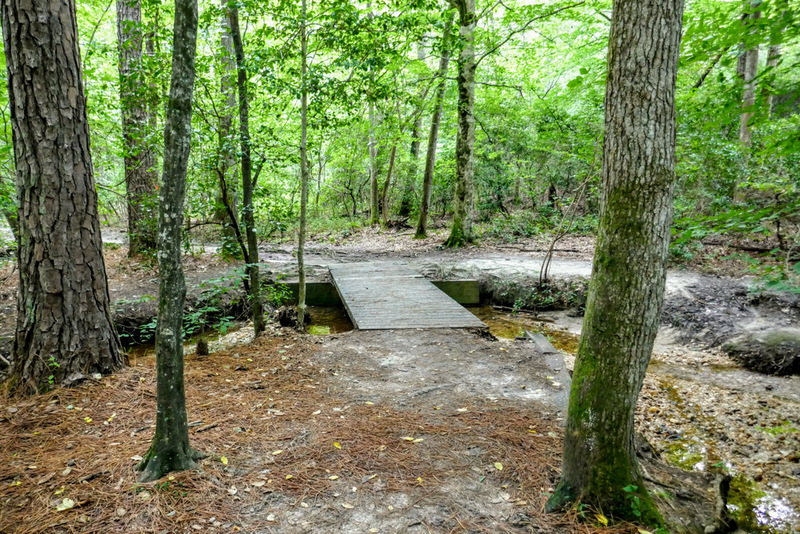 Mile 0.5 – First wooden bridge over Little Creek. 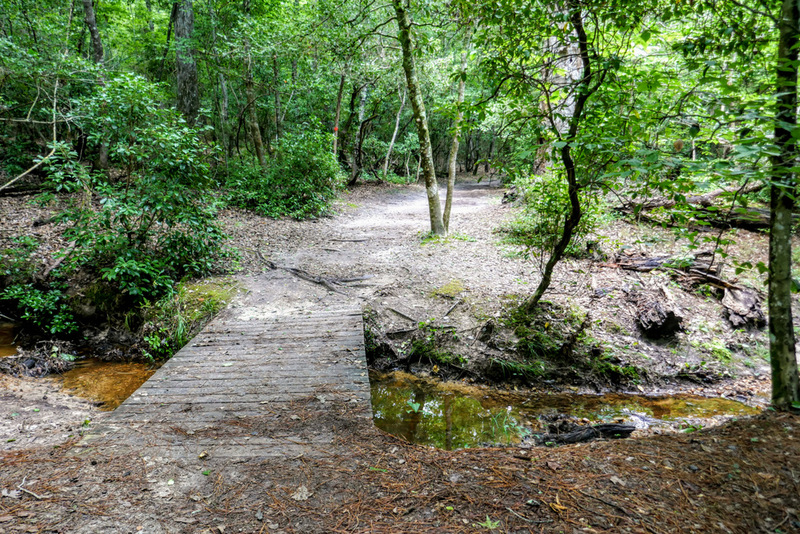 Mile 0.65 – Second wooden bridge over Little Creek. 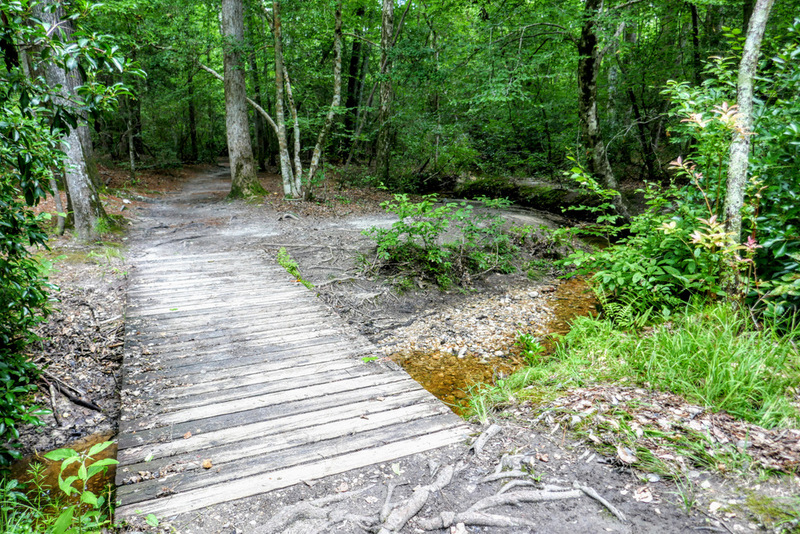 Mile 0.75 – Third wooden bridge over Little Creek. 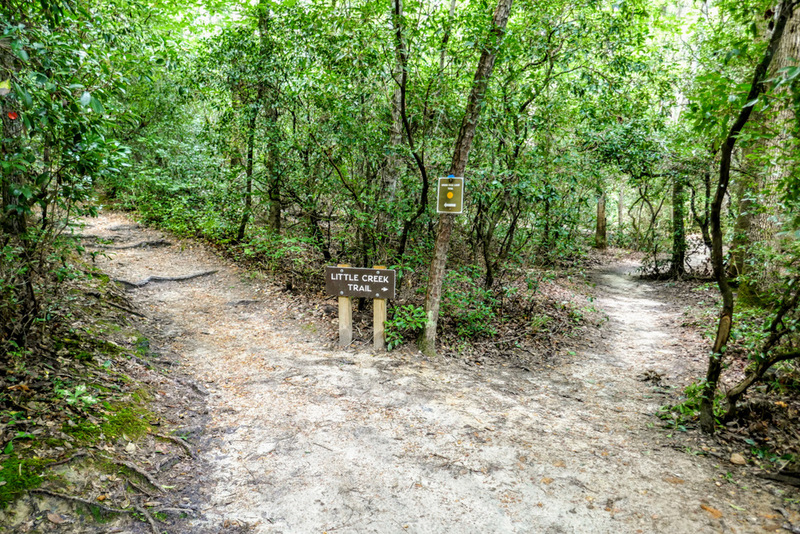 Immediately after the crossing is a Y-junction with the Little Creek Loop Trail (blue hexagon trail) on the right. 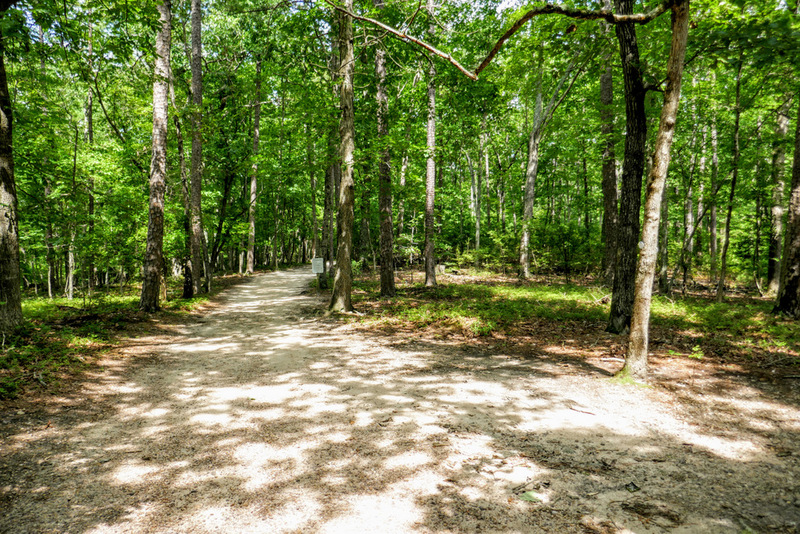 The Little Creek Loop Trail is the only access to the backcountry group campsite. 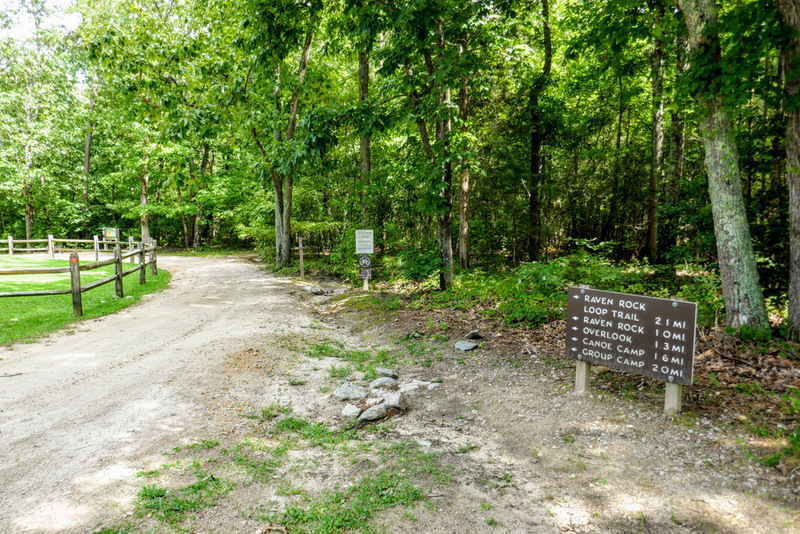 Mile 0.9 – T-junction with the Little Creek Loop Trail on the right. 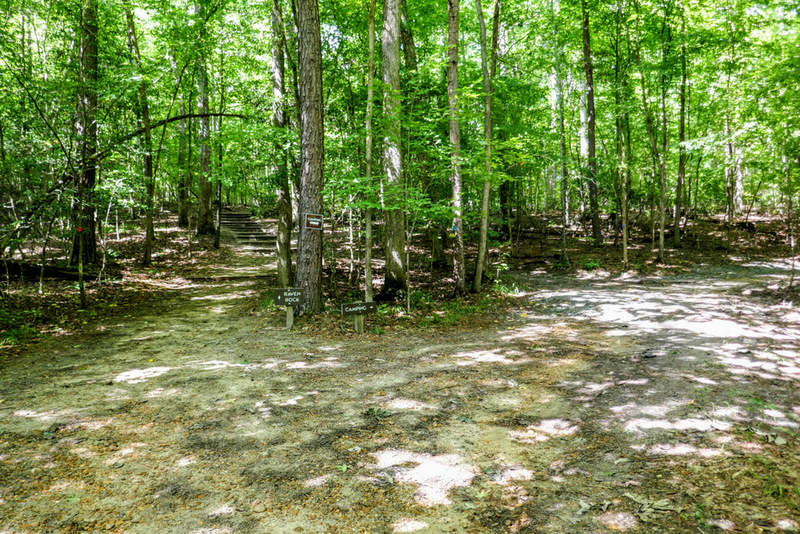 Mile 0.95 – T-junction with the descent trail to Raven Rock. Continue straight and soon you will descend 135 steps to the base of Raven Rock. 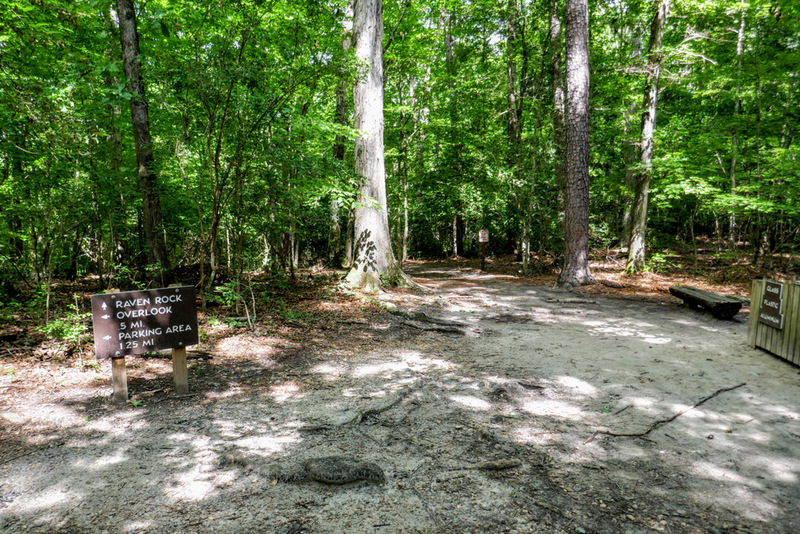 Mile 1.0 – The steps end at the base of Raven Rock close to the shore of the Cape Fear River. On the right the trail peters out below a massive cliff. 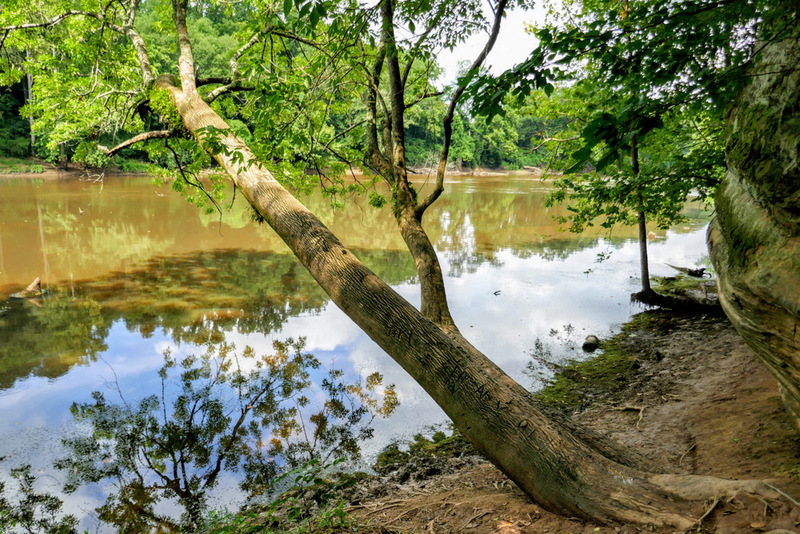 A tree leans over the river providing a nice viewpoint. Mile 1.1 – Back at the base of the stairs the trail heads west following the cliff base. 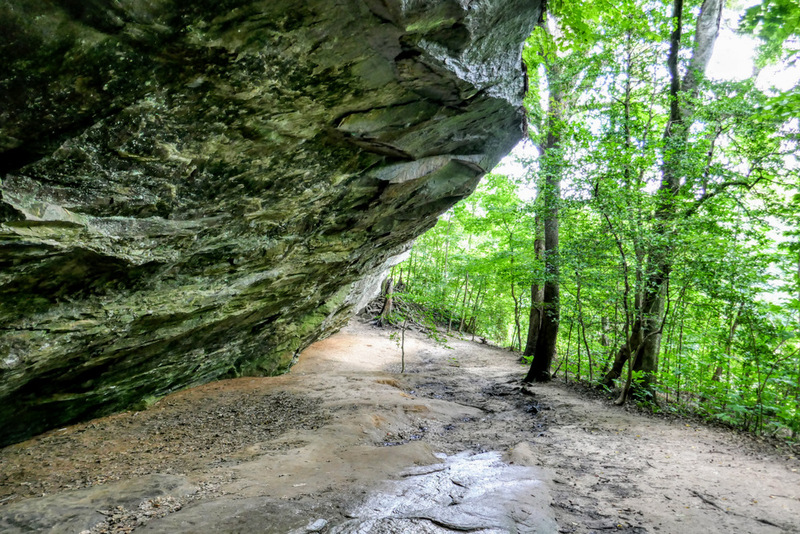 Immediately the trail passes under a massive overhang. 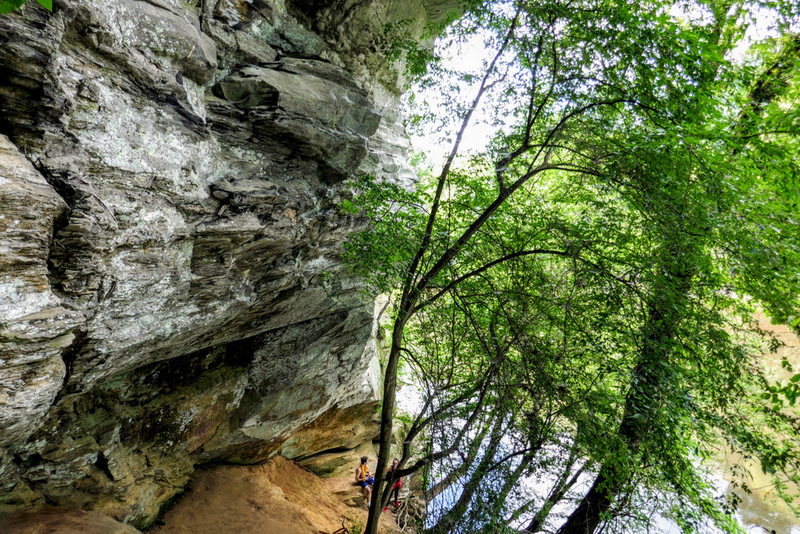 The chalky white cliffs of Raven Rock rise above the Cape Fear River for hundreds of yards and at times are nearly 100 feet high. 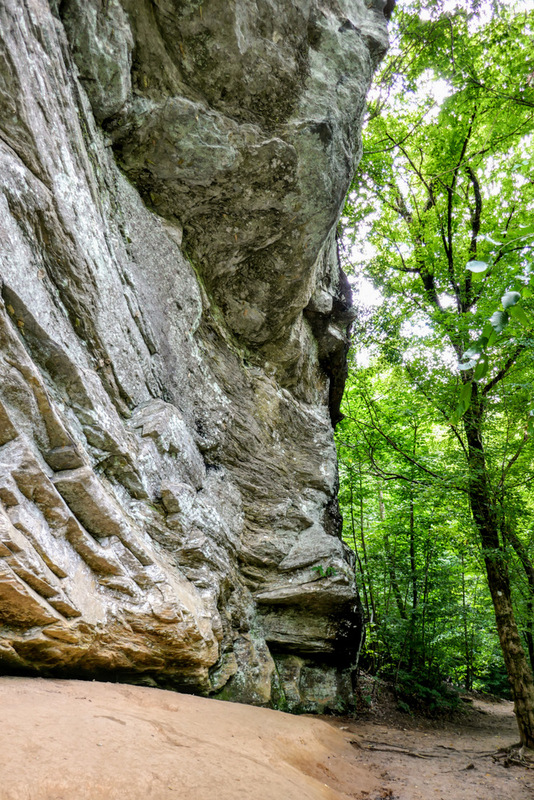 These are arguably the most impressive cliffs east of the Sauratown Mountains. 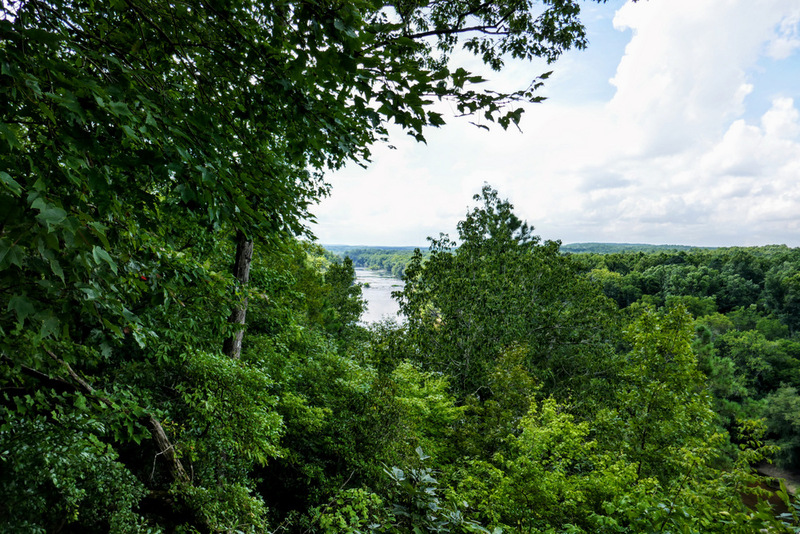 There are multiple paths down here below the cliffs, some heading to viewpoints along the water and some sticking close to the cliffs. 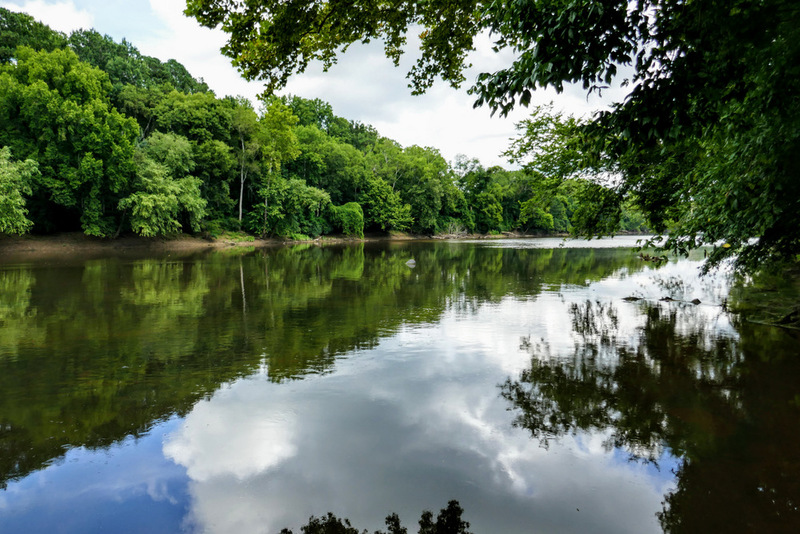 Mile 1.3 – The path ends where the cliffs meet the water, it is impossible to continue from here without getting into the river. 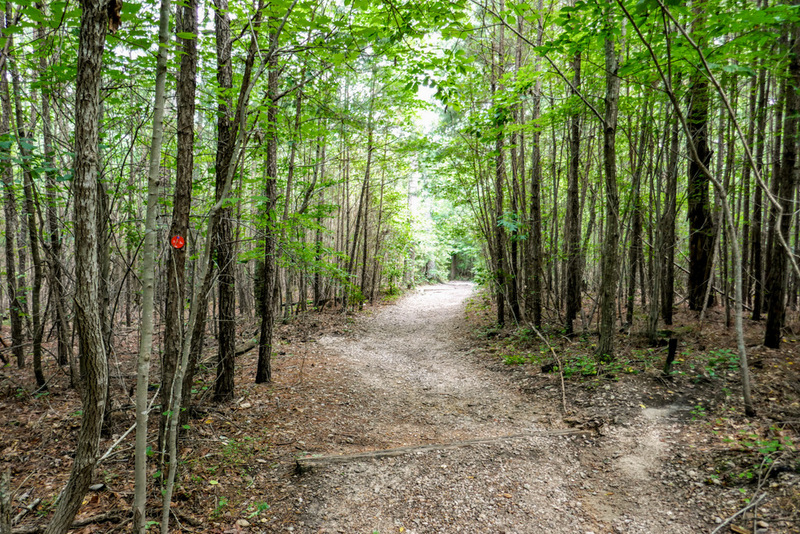 Mile 1.5 – Turn right on the Raven Rock Loop Trail following the crest of Raven Rock. 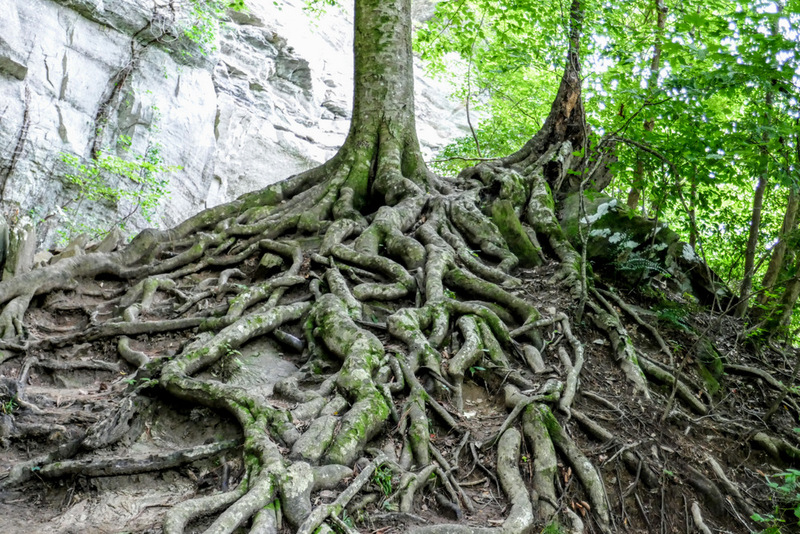 There are no views from the trail on this quarter-mile stretch. 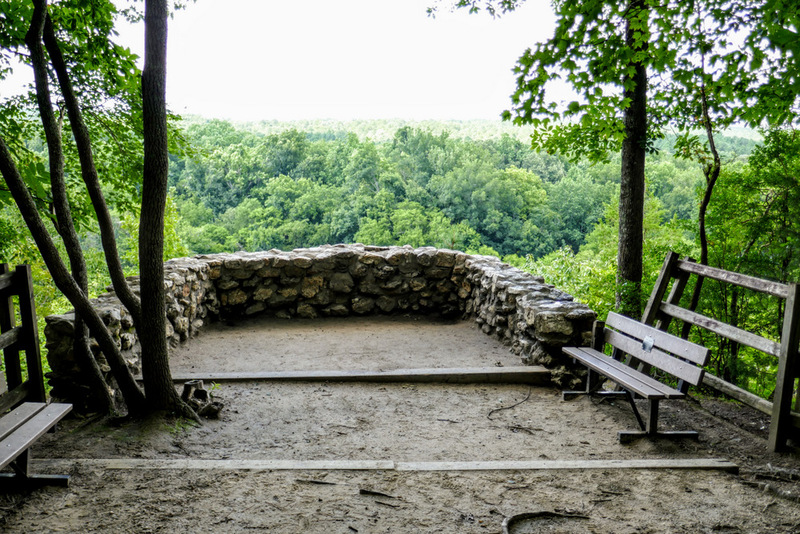 Mile 1.8 – The Raven Rock Overlook is located off to the right of the trail. 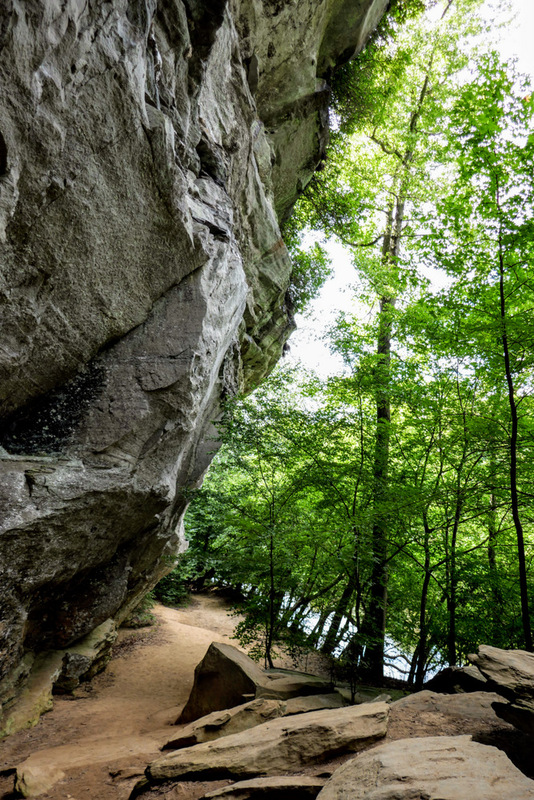 This stone observation perch rises more than 150 feet above the Cape Fear River. 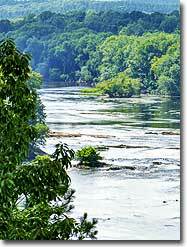 Looking upstream you should be able to see the Fish Traps rapids and Northington Ferry. Mile 2.3 – T-junction with the Fish Traps Trail (blue triangle blaze) on the right. 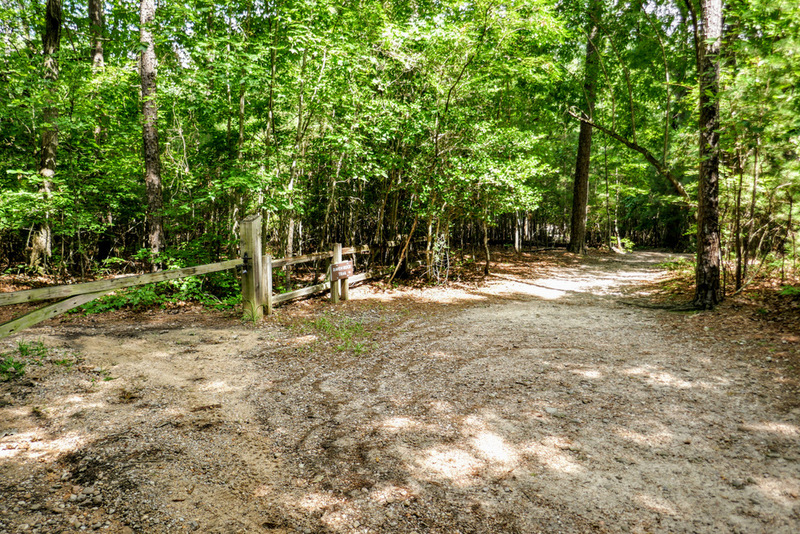 The Fish Traps Trail is also the connection for the Northington Ferry Trail. 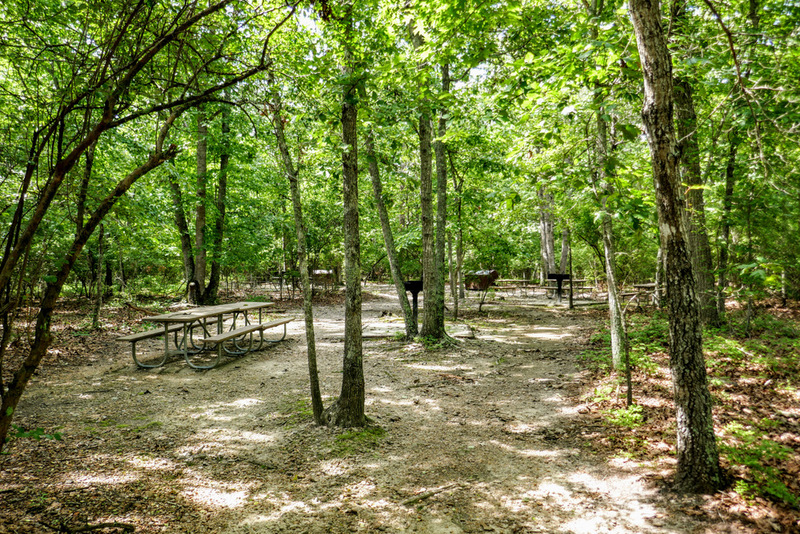 Mile 2.7 – Hike ends at the parking area.